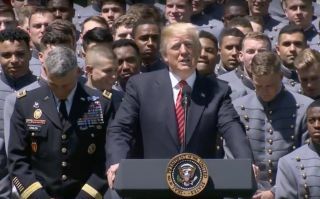 President Donald Trump presents the Commander-in-Chief's Trophy to the Army Black Knights college football team during a ceremony at the White House on May 1, 2018. He also restated his desire to create a new branch of the military called the Space Force. President Donald Trump's "Space Force" idea is no joke. During a speech at the Pentagon at 11:15 a.m. EDT (1515 GMT) today (Aug. 9), Vice President Mike Pence will outline the administration's plan to create a new branch of the military focused on defending the ultimate high ground, The Washington Post reported Wednesday (Aug. 8). You can watch Pence's Space Force speech live here, courtesy of the White House. Pence's speech alone won't establish the Space Force; setting up a new military branch requires congressional approval, The Post noted. The U.S. military currently consists of five branches — the Army, Navy, Air Force, Marines and Coast Guard — and a new one hasn't been created since the Air Force got off the ground in 1947. But Trump has continued to push for a Space Force, so the idea may well become reality before long. Military leaders "are in complete alignment with the president’s concern about protecting our assets in space to contribute to our security to our economy, and we're going to have to address it as other countries show a capability to attack those assets," Defense Secretary Jim Mattis told The Post. Mattis stopped short of giving a wholehearted endorsement of the Space Force as a separate branch, however. "I don't have all the final answers yet," he said. "We're still putting it together." Editor's note: This story was updated Aug. 9 to include details of the White House webcast for Pence's Space Force speech.